Introduction: Recent literature regarding the treatment of acute diverticulitis has supported non-operative management or delayed operative management in the setting of acute disease. This can result in longer hospital stays and indolent symptomatic disease that can be both morbid and costly to the patient. The purpose of this study is to determine the incidence of operative complications and peri-operative morbidity related to laparoscopic single-stage resection in treatment of acute sigmoid diverticulitis with or without local perforation (Hinchey classification I/II). Methods: Retrospective chart review was performed from March 2009 to July 2011 of all patients undergoing laparoscopic single-stage resection for acute sigmoid diverticulitis. Patients with either CT-proven diverticulitis or clinical symptoms consistent with recurrent diverticulitis who underwent operative intervention within two weeks of presentation were selected for chart review. Patients without physician documentation or imaging consistent with acute diverticulitis and patients with findings consistent with peritonitis (Hinchey classification III/IV) were excluded. All patients underwent laparoscopic resection, with or without hand-assistance. Intra-operative complications, operative times, post-operative morbidity, and length of stay were documented. Additionally, pathology reports were examined for confirmation of acute diverticulitis and evidence of local perforation or abscess formation. 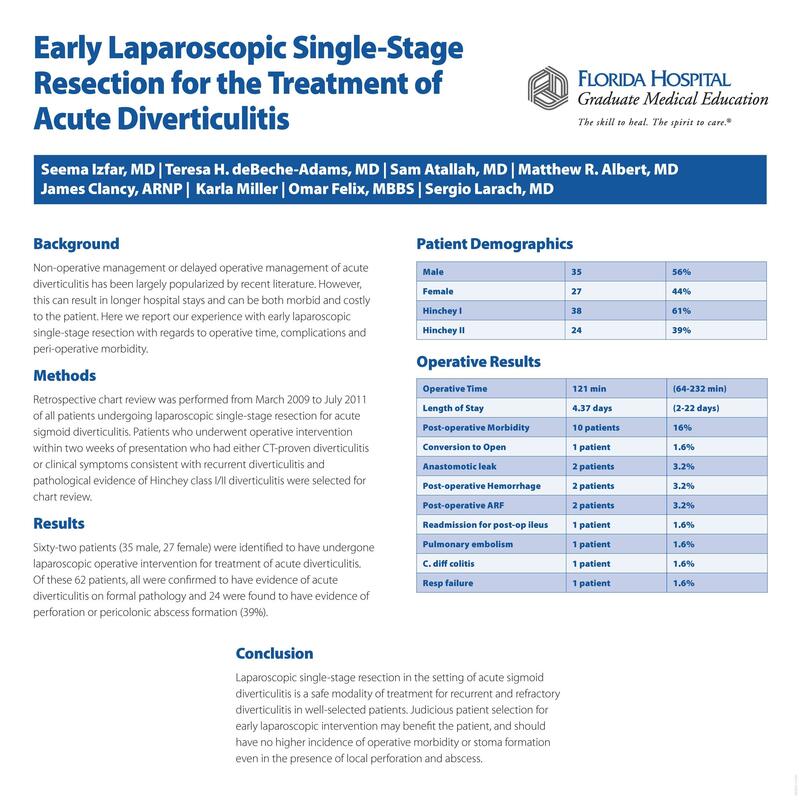 Results: Sixty-two patients (35 male, 27 female) were identified to have undergone laparoscopic operative intervention for treatment of acute diverticulitis. Of these 62 patients, all were confirmed to have evidence of acute diverticulitis on formal pathology and 24 were found to have evidence of perforation or pericolonic abscess formation (38%). There were no intra-operative complications reported and no intra-operative blood transfusions. One patient was converted to open (1.6%). Average operative time was 121min (64 – 232 min). There were two contained anastomotic leaks reported (3.2%), one of which was treated with a Hartmann’s resection, and the other treated with a revision of end-to-end anastomosis. Post-operative morbidity overall was 16% (10 patients). Morbidities included acute renal insufficiency (3.2%), post-operative hemorrhage requiring blood transfusion (3.2%) post-operative ileus requiring readmission (1.6%), Clostridium dificile colitis (1.6%), pulmonary embolism (1.6%), and respiratory failure requiring reintubation (1.6%). Average post-operative length of stay was 4.37 days (2-22 days). Conclusion: Laparoscopic single-stage resection in the setting of acute sigmoid diverticulitis is a safe modality of treatment for recurrent and refractory diverticulitis in well-selected patients. In our study, we have shown results comparable to elective resection after delayed management with antibiotics. Though operative intervention in the setting of acute diverticulitis may still result in postoperative morbidity and longer operative times, in well-selected patients, there should be no higher incidence of operative morbidity or stoma formation even in the presence of local perforation and abscess. Judicious patient selection for early operative intervention in the hands of experienced laparoscopic surgeons may benefit patients with complicated or refractory diverticulitis.